Build it Yourself! 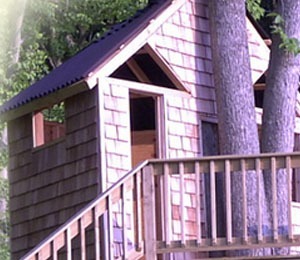 Buy a treehouse plan or supplies from our affiliate company. Visit Treehouse World to meet us, see our work, and have some fun! The tree house design and building process. The first step in designing your treehouse is to gather information about your goals and your resources. This information is the foundation for the rest of the planning, designing and building your tree house. What are your Goals for the Treehouse Project? Who is going to use the treehouse? What design elements are important to them? What is the minimum floor space required? What should the treehouse look like? What theme should it have (victorian, simple clubhouse, pirate ship, etc)? What materials should we use to best embody your style and vision? Should the tree(s) support the treehouse, or should we use some posts for ground support? Do you prefer knee braces or cables? What Resources can be used for your Treehouse Project? What trees do you have to work with on your property? How much time do you have to devote to the construction process? What is your budget for the treehouse project? Do you have useable materials for part or all of the project? Do you have lodging we can use while in town working on your treehouse? Is there a carpenter or laborer you know who can help? Do they have carpentry and/or tree climbing skills? Anything else that may be useful for planning a treehouse construction project? The process of designing your tree house typically follows one of the following two paths. After reading through the options, please contact us and let us know how we can help you plan, design and/or build your treehouse. With all of the types of design services available, we have created this handy table to help you determine what level of design is appropriate for your treehouse project. Start here first! Basic Tree House Design Process: The most affordable and expedient way to design your custom treehouse – great for basic or simple kids tree houses and free estimates. You may start down the basic path and then upgrade to more complete design services at any time. Complete Tree House Design Process: The highest level of design service for tree houses – best when high quality and complete planning is the primary focus. Or contact us if you are ready to start designing your custom tree house today!